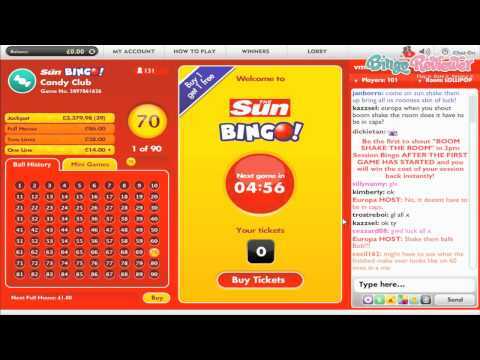 Sun Bingo is blacklisted due to their breach of the original contract between us for marketing services. As of 1 July 2017, they switched over from The Sun Affiliates to Nethive. They informed us that the initially agreed upon lifetime commission will cease leaving them with an unfair advantage. Such bad business practices have not gone unnoticed and we see it fit to caution players. Owned by The Sun, the layout is and always has been easy on the eyes. After various clever TV campaigns they have created one of the most popular online bingo sites in the UK with thousands of members logging on daily. Joining is easy peasy and the site goes to great lengths to provide a safe and secure haven giving players peace of mind that details will be safe when funding accounts. It remains easy to navigate and offers instant access to all the games without requiring any downloads plus mobile bingo games add to the convenience factor. Once powered by the Gamesys platform, the brand made the switch over to Playtech’s bingo software, Virtue Fusion, along with sister site Fabulous Bingo. Players will be pleased to know that they haven’t lost all access to Gamesys products as several of the slots are still sprinkled throughout the game list. The bingo offering is good with the most popular variations, 75-ball and 90-ball, available. UK bingo fans are no strangers to the bingo clubs around town so it’s great news that you can now enjoy a similar concept at home with Session Bingo. Buy a book of tickets for a set price and proceed to play a block of games offering lucrative prizes. You’ll also have big money possibilities by joining in on Linx games. Jackpot Slots: Age of the Gods, Gladiator, Everybody’s Jackpot, Beach Life, Streak of Luck, Jackpot Giant, Frankie Dettori’s Magic 7 and Leprechaun’s Luck. Slot Games: The Winnings of Oz, Amazon Wilds, Great Blue, Amazon Wild, Piggies and The Wolf, Mr. Cash Back, Wild Gambler, Hot Gems, Desert Treasure, Ice Run, Safari Heat, A Night Out, Ace Ventura, Top Gun and many more. Table Games: 3 Card Brag, 3D Roulette, Perfect Blackjack Multihand 5 and Casino Hold’em. Don’t forget about the scratchcards, which offers Monty Python’s Spamalot and Kong Scratch. There is never a short supply of promotions at Sun Bingo and the marketing team brain storms some pretty fantastic offers. You can bet you’re going to be warmly welcomed with a generous sign-up bonus. Beyond the first deposit players will find themselves among various giveaways, prize draws, special games, BOGOF card specials and much more. Just like its sister site, the maximum withdrawal limit is impressive at £10,000/€10,000 every 24 hours. For a bingo site, this is really great to see. UK players have a gem at their fingertips in terms of game selection, reputation and support so we award them with 4 Pink Hearts. I really love it that they formatted the site to look more like a newspaper than a bingo site. The layout is just great for this site! Fun games on the site are really what people should go to Sun for. Great value! You can have fun for as low as 1p per ticket. The link games that they have are super! You stand to get a lot of money in winnings, but your tickets are the same price! I think that beginners should try Sun bingo... They are much easier to understand than other sites! I think i read somewhere that Sun Bingo merged with another network? Not sure how true that is. They pretty much offer the usual gaming selection here. 75, 80 and 90 ball complete the list of bingo. Also offered are really unique and fresh variations though, like session and bargain bingo! You gotta love bargain bingo! In their version, it’s a 90 ball game and you have 3 chances to win. You can bingo on 1 line, 2 lines or a full house. There are also three progressive jackpots, which can be won when you get a full house in 40 numbers or less. The slots are also very impressive and have great low bets for those of you who prefer them. I really enjoy the free bingo here. A free 90 ball game is offered daily. All you have to do is log on to the site each day to claim your free tickets for a daily 7pm free game that gives away a £125 prize. There Session Bingo is really something different. It's a mixture of all the favorites; 75, 80 and 90 ball all rolled into one great game. You won't need sunscreen when you play at Sun Bingo, but it's for sure you will enjoy visiting this site for all of the fun games that they have available for your entertainment. The overwhelmingly red background is easily recognizable from the adverts they are always running on the TV. With a really huge member base, Sun Bingo offers a large variety of bingo rooms where you'll be able to play once joining the site. Sign in everyday to play a free game and be sure to participate in the chat rooms and earn not only new friends but win bonus money for extra playtime for yourself. Their site is easy to navigate and registration is also a quick process. Besides bingo, they offer a nice variety of slot games and the prices are so low that you get a lot of playtime in for a very low cost. The instant games are very attractive and give you a way to play in more than one game at one time. I found the registration process to be very simple here. I was off and running in no time at all. They have pretty speedy payouts and I have yet to come across any problems here at all. I also really liked that they offer a 24/7 number that you can call for any issues or questions you may come across. I have had no problems here yet, but I take comfort in knowing that someone will be on hand should I have any problems. The welcome offer here is nothing too out of the ordinary. New players will receive a 200% bonus on your first deposit as long as it is a minimum of at least £10. They have 75, 80 and 90 ball bingo. Bargain bingo is available as well which is a nice little treat. Slots and instant win games can also be found. They also have a nice amount of free bingo here and it is offered every Tuesday and Thursday. I know that a lot of people are reading The Sun, so it doesn't come as a surprise that they also have an awesome casino site and that it turns out they are really popular. Probably among the best UK sites, The Sun combines the fresh site design with great games and good prize pool. The site is simple to use, the registration process very fast, easy and without any problems. At the moment, there is a sign up 200% bonus, so you can deposit £10 to get £30 to play with, and as a special bonus, you get £10 to spend online with Domino Pizza, so not a bad deal for a start. Too bad there is no free No Deposit Bonus. There are some other bonuses ready, and it took me a while to read all of them. The bingo games are available at 75, 80 and 90 ball variants, so not a bad deal if you like the variety.